Be waylaid by a hostile Actor with a Clue. Face a Fight instead of a check. Normally, I would use various tools to randomly determine this Actor, but this time I don’t. Almost immediately, an image came to my head of a big, tough guy, covered in burning tattoos, consumed by an unquenchable fire. I decide his combat prowess is typical for the Story (Physical Threat 2, or 7), and that he is going to try and ambush Hanson. But, to keep things interesting, I decide that his tattoos mean that his attacks are going to be aggravated. Which means that Hanson both will not be able to soak the damage for this combat, but also that they will be particularly hard to heal. It also means that she could face final death in this fight. Is he able to ambush her? Rather than relying on an opposed system, I set the difficulty for Hanson to detect the ambush to 8, based on the Story’s Mental Threat. She’ll need to roll Perception + Streetwise to figure it out. Perception+Streetwise  5,10,7,3 and she gets 1 success. Just enough to not be defenseless. Hanson walked along the sidewalk on the edge of the park, trying to figure out where she could go next. What could possibly be going on that would bother Samuel so? And if they could scare him, why were they going through cutouts to actually call the police? Why involve the police at all? She stopped. Something was wrong. This street, at this time of night, should have been busier. At least a few cars and cabs should be driving by. Junkies should be making their way to and from the park for their latest score. Music should be blaring from somewhere. But instead it was quiet, and empty. She heard something behind her, a loose bit of gravel being knocked along the sidewalk and turned just in time to see a blur of muscles and burning tattoos come rushing at her. Tattoo Boy is attacking Hanson with his fists, so there is no need to roll Initiative. Since Hanson only got 1 success on her “detect ambush,” I rule that she won’t be able to spend blood to activate her Celerity. Both will be making Dexterity+Brawl rolls for their attacks against a difficulty of 6. Winner is whoever has the most successes compared to their foe’s. TB  7,4,2,8,1,6,10 for 3 Successes. Hanson  2,5,2,6,6,10 for 3 Successes. Hanson is able to avoid the incoming blow and moves to the side. The two combatants eye each other warily for a second, before closing in again. Hanson is now able to spend blood to activate Celerity. 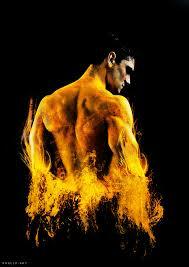 I decide, for no particular reason, that Tattoo Boy has no disciplines—his flaming attacks are dangerous enough! TB  4,8,6,3,5,10,3 for 3 Success. Hanson  10,3,9,7,10,8 for 5 Successes. Hanson beats Tattoo Boy by 2 Successes. She’s now able to roll her Strength  + Successes  against a difficulty of targets Stamina  + 3, or 6. She’ll get to add her Potence of 1 as an automatic success. Damage  10,2,7,6,2,6 +1 for 5 successes. Tattoo Boy can now attempt to soak. A “normal” mortal can’t, but he is obviously far from normal. He will roll his Stamina  against a difficulty of Number of Successes from the attack  + 5, or 7. Soak  3,1,7 for 0 successes, as the 1 takes away the 7. Tattoo Boy takes 5 levels of damage. Hanson can now take her Celerity Action. Tattoo Boy has no actions left to defend against this attack. Hanson  2,2,2,6,6,8. Not the best hit, but still 3 Successes. Damage  3,5,10,10,9,5,3 + 1 for 4 successes. Soak  5,8,2. 1 Success. He only takes 3 levels of damage, but that’s enough to drop him below Incapacitated. Hanson dodged out the way, doing everything she could to keep the flaming fists and arms away from her. His head, though, she thought. His head is unmarked. She jabbed at his face, distracting and disorienting him. She soon found her rhythm, and used her preternatural speed to dance around the clumsy oaf, striking him repeatedly in the head from all possible angles. Each strike broke bone, and bloody clumps of hair were soon glued to her fists, but she kept pounding him. Pounding until she finally heard the final crack and her hand smashed into something soft. As he fell to the ground, the flames that emanated from his tattoos seemed to burn with increasing intensity. She had no desire to touch the burning body, but needed something from him. She pulled out her Polaroid camera and took two quick photos, hoping to record as much of the tattoos as possible. She had no idea what these were, but knew that someone with power, power they shouldn’t have, had done this. Hanson has succeeded on her Investigation scene, and now has a useful clue—the photographs of the tattoo’s. She gains one Victory Point and a Clue. The “Investigation & Action” scene counter increases, and her Opponents gets to roll to see if they gain a Victory Point. They roll and get an 8. As this is above the current count, they fail to gain one. She also got involved in a brutal fight out in public with a man who had burning tattoos. If any saw her, this could increase the Heat. As I’m not sure, I give 50/50 odds. Did anyone see her fight with Tattoo Boy? [50/50 odds—50%] 2. ABSOLUTELY YES. Ok, someone saw, a mortal, and someone to be taken seriously. We’ll say a cop who was on an unrelated stake out. He would have stepped in to help her, but seeing the fight and the corpse burn up was a bit much for him. The Heat increases by 2. This might a bit tricky to pull off. I’m still not sure WHO the Opponent is, so picking an ally of theirs is a bit odd. I decide that whomever Hanson goes to visit about the tattoo’s will be a secret ally of the Opponent, and that, regardless of success or failure, she will figure out who the Opponent is. But that’s for the next scene.